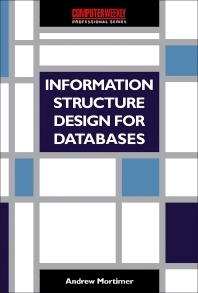 Computer Weekly Professional Series: Information Structure Design for Databases: A Practical Guide to Data modeling focuses on practical data modeling covering business and information systems. The publication first offers information on data and information, business analysis, and entity relationship model basics. Discussions cover degree of relationship symbols, relationship rules, membership markers, types of information systems, data driven systems, cost and value of information, importance of data modeling, and quality of information. The book then takes a look at entity relationship modeling connections, one-to-one relationship, and entity relationship modeling advanced topics, including connection traps, resolving many-to-many relationships, four combinations of membership, and entity merging. The text examines logical data dictionary, data flow diagrams, entity life history, and developing database applications. Topics include data modeling during development, waterfall approach, iterative development, sequence, selection, illegal data flow linkages, conservation of data, second normal form rule, and denormalization. The book is a valuable reference for researchers interested in data modeling. What is an Entity Relationship Model?